You’ll meet someone. Someone very special. Someone who won’t press charges. I love this movie soooooo, soooo, soooooo, sooooooooooooooooooooooooooo much!!!! I have to watch it every October and any other time it is on TV. I have loved this movie since I was a kid as it is so hilarious and the dialogue is truly amazing. I really don’t know where to start with this post as I love every part of this film. To be honest, you just need to watch it! It is that good. Much, much, much, better than the first film; don’t even watch it, enjoy this one. This is one of the few times where the sequel far surpasses the original. 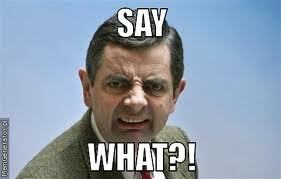 Yes you heard me. The sequel was better. 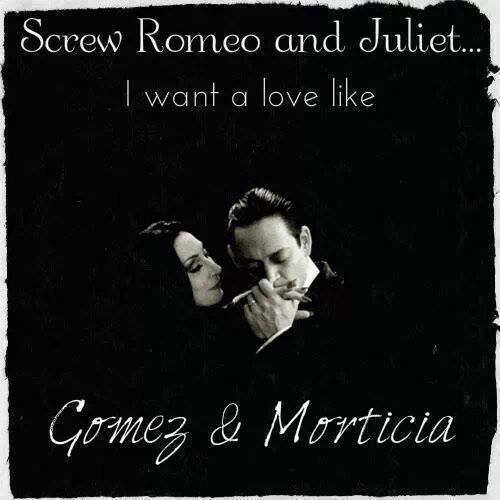 I just love Morticia and Gomez, they are an amazing couple. The story is that Morticia and Gomez have had a new baby; which Wednesday and Pugsly hate and are trying to destroy. 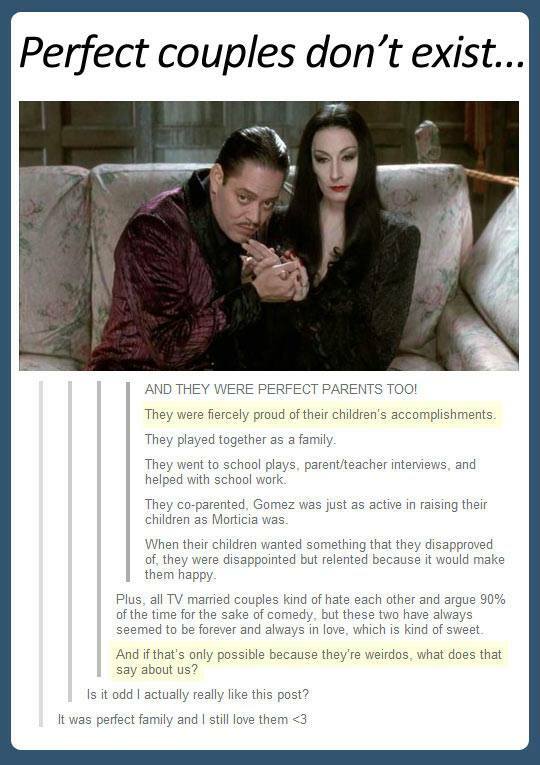 Anyways, Morticia and Gomez attempt to hire a nanny because Morticia would like some time to herself. After going through a slew of them, they finally get Debbie Jellinsky, played by the amazing Joan Cusack. Debbie seems really nice at first, but we find out that she is trying to get close to Uncle Fester, marry him, kill him, and getting all his money. In fact we find out that Debbie is no ordinary gold-digger, but a full on serial killer. Wednesday and Pugsly find out, so Debbie has them sent off to a summer camp which is hilarious. 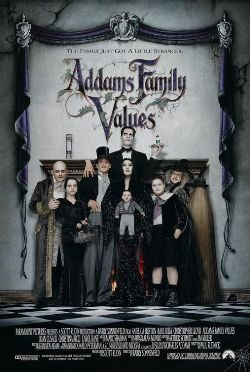 This has some of the best scenes in the film as the kids wreak Addams’ havoc. Debbie tries to complete her plot, but it takes a lot to kill an Addams! Just watch the film! You’ll love it! So one of my favorite parts, is the play that they put on at the summer camp. In the film the camp counselors have broken Wednesday and Pugsly’s spirits, forcing them to watch Disney films which causes them to become perky. They and the other “losers” of the campers are playing the Native Americans in a Thanksgiving play that one of the counselors wrote. But nothing ever goes as planned when an Addams is involved! Wednesday is AWESOME! I love her. 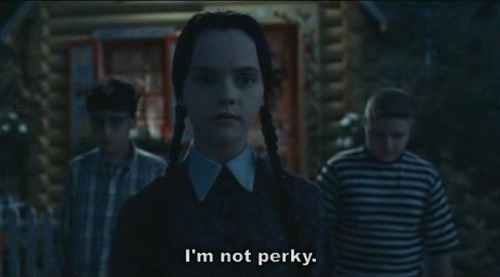 Christina Ricci did an amazing job at being her. I couldn’t imagine a better person. My other most absolute favorite part is when we get to hear Debbie’s backstory, and why she turned to a life of murder and thievery. I LOVE this part so much! I have the whole thing memorized and love to recite it! That’s today’s terrifying post! More to come! 8 Days ‘Till Halloween! Here’s a cover page/poster I made for my facebook page as part of my countdown to Halloween last year. This entry was posted in Horrorfest and tagged Addam's Family, Addams Family Values, Anjelica Huston, Baby, Backstory, Broken Spirits, Camp Counselor, Childhood Film, Christiana Ricci, Com-Ror, Cousin It, Crusade, Crusades, Dark Forces, Debbie Jellinsky, Disney Film, Family, Film based on a TV Series, Film based on a TV Show, First Film, Get All the Money, Gold-Digger, Gomez Addams, Halloween, Hate the New Baby, Havoc, Hell, Hire a Nanny, Horror-Comedy, Husband, Inherit, Jewelry, Joan Cusack, Killer, Losers, Love, Loving Husband, Lurch, Marry, Marry for Money, Memorized, Mickey, Modern Woman, Money, Morticia Addams, Murder, Murderer, Nanny, Native Americans, New Baby, Not Perky, October, Pilgrim, Pilgrims, Play, plays, Pubert Addams, Pugsley Addams, Put on a Play, Recite, Romeo & Juliet, Scream 2, Sequel, Sequel Better than Original, Serial Killer, Spanned Sequels, Strong Independent Woman, Summer Camp, Thanksgiving, Thanksgiving Play, The Addams Family, Theif, Thievery, Thing, TV, TV Show, Uncle Fester, Watch Disney Films, Wednesday Addams, What. Usually I do not read post on blogs, however I wish to say that this write-up very forced me to take a look at and do so! Your writing taste has been surprised me. Thank you, quite great article.